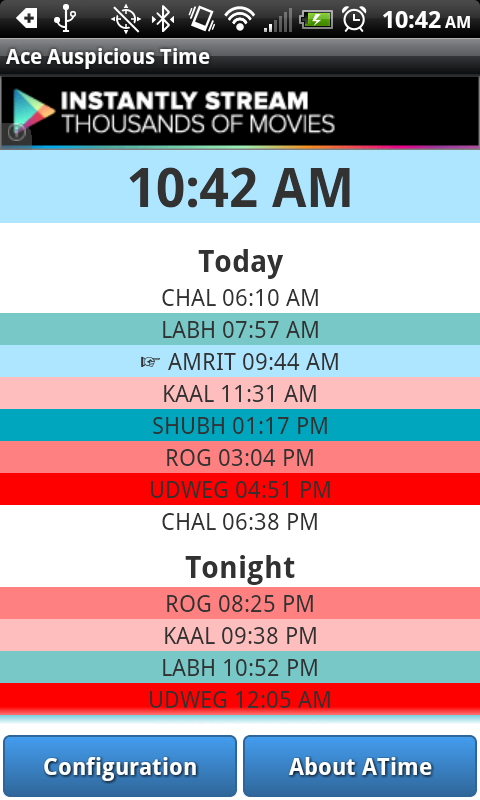 Created for PyraHealth.com, Ace Auspicious Time calculates beneficial times for activities at your location. Using Indian Vedic astrology, the day and night’s eight Choghadiya Muhurtas are calculated. The Choghadiya time intervals have a nature of being good, neutral, or bad for starting an activity. Your location and time zone are used to calculate your sunrise and sunset. For planning events elsewhere, you can change your latitude and longitude. Available from the iTunes market for your iPhone, iPod and iPad. This entry was posted in Android App, Free, Lifestyle. Bookmark the permalink.